Freelance photographer Esther Bubley (1921–1998) gained renown for her revealing pictures of Americans from 1945 to 1965. During this “golden age” of American photojournalism, Bubley created probing and gently humorous images. With a prodigious ability to put her subjects at ease, Bubley was able to create complex narratives. 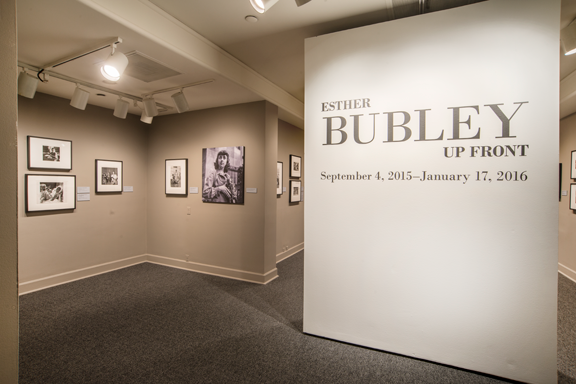 NMWA’s latest exhibition, Esther Bubley Up Front, presents 27 prints recently donated to the museum. Bubley contributed photos for popular magazines, including Life and Ladies’ Home Journal. Publications such as these provided a window to the world through “picture-stories.” While television was a relatively new phenomenon, magazines were still a main source of news and entertainment for American society. Bubley contributed photo essays frequently, adding clever and observant captions shaped from her copious notes. 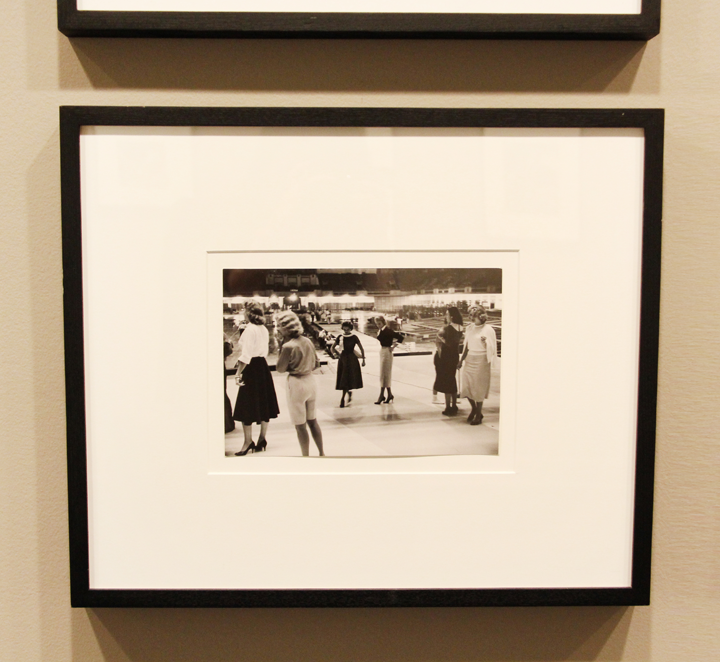 In particular, Bubley’s photos of the 1957 Miss America pageant represent an intriguing moment in history. Bubley’s photographs do not depict polished moments. Instead, she captured images behind the scenes. Her photographs document backstage preparation and curious bystanders. Through turning her lens away from obvious photo opportunities, Bubley managed to find the candid, offbeat moments before and after the competition. Bubley’s Backstage in Quest to Be Miss America—Atlantic City, New Jersey (1957) includes both contestants and onlookers. Using a small handheld camera, Bubley developed a quick, point-and-shoot style. Her unobtrusive equipment, combined with her method of meeting her subjects and then “waiting until they got thoroughly bored with me and went back to their own conversations,” resulted in engrossing, active images. 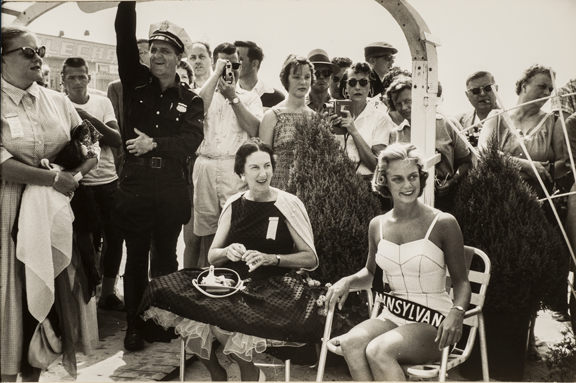 NMWA’s exhibition includes several of Bubley’s pageant photos. Accompanying wall text shares a humorous anecdote about the contestants before the competition. Bubley observed, “Backstage, the girls became very sociable, exchanging addresses with one another. Miss Kansas gave all the other misses sunflower earrings and Miss Idaho gave out packages of instant mashed potatoes. But there were frustrations and tensions and blow ups. Miss Puerto Rico lost the record she was supposed to dance to. Miss Alabama lost weight, and her clothes began to sag. Miss Oklahoma, in excitement, lost her lunch.” Together with her photographs, Bubley’s note immerses viewers in the backstage environment. By the mid-1960s, however, television had replaced magazines as the primary source of popular news and entertainment. The shift from print publications to television as the largest and easiest source of information undermined the demand for top photojournalists like Bubley. However, museum visitors can see the accomplished photojournalist’s work in Esther Bubley Up Front through January 17, 2016. Visit the museum to learn more!